From lavish holiday feasts to wine and cheese parties, you love to entertain. Your gracious hospitality is evident the moment your guests enter the striking two-story foyer. From there, the delicious aromas and a naturally inviting floor plan will lead them into the heart of your home. 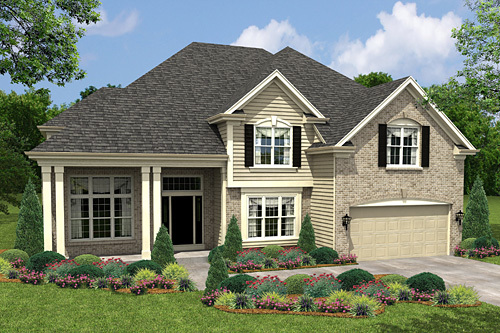 On the way, they cannot help but admire the elegance and architectural details evident throughout the Riverstone. Just off the foyer, an arched entry with columns leads to the dining room opposite, a large living room extends a refined yet warm greeting. A powder room, alcove, laundry, and private study are conveniently located off the hall, as is the centerpiece of your home, the expansive kitchen. Equipped with an island, butler's pantry, and spacious dinette, the kitchen opens to an impressive family room with fireplace, 12-foot ceiling, plant ledge, crown molding, and transom windows. Upstairs, a spectacular view of the living room and foyer and a loft enhance the open plan. Steps from the loft, a private sitting area leads to a huge walk-in closet and master bath with dual vanities, water closet and linen closet. On the other side is a vast master bedroom. Three more large bedrooms and a second bath complete the second floor.